1. Creation of an Education and Labor Collaborative interested in conducting qualitative research examining what young people are taught (or more typically NOT taught) about class and labor issues in schools, socializing institutions, and the popular media. We take an activist approach to this inquiry and aim to organize educators, communities, and unionists to work together for alternative ways of educating young people. 3. Shinnecock Nation Cultural Center and Museum Partnership to address “Anti-Indianism” in the general K-12 curriculum. We work together to provide workshops and resource materials to help local teachers gain cultural competency to the authentic history and contemporary interests of Long Island’s Indigenous community. 4. Service learning and Community-Based learning initiatives involving, among other projects, the creation in 2004 of the Caroline Wambui Mungai Foundation, which currently provides a caring home and schooling for 43 children, ages 3-10 in Wangige, Kenya. 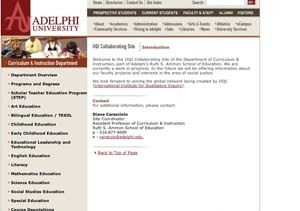 We look forward to adding more initiatives to our site in the coming year and welcome the comments, suggestions and collaboration of our Leigh Benin, Assistant Professor of Social Studies Education Diane Caracciolo, Assistant Professor of Curriculum & Instruction Rob Linne, Associate Professor of English Education Anne Mungai, Associate Professor and Chair of Curriculum & Instruction Department and Director of Special Education Programs Rita Verma, Assistant Professor of Adolescence Education.